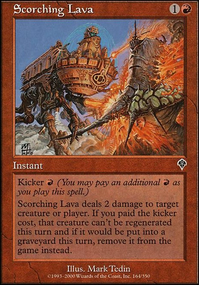 Cultivator of Blades is an example of a card with messed up legality. It doesn’t state it’s illegal or legal. It doesn’t list Brawl as a format at all on that page. Many other cards from that block and the next are similarly affected, but there is no pattern as to why. Desert of the Glorified is affected but not Desert of the Indomitable. Sadly this kinda deck wouldn't hold up in my meta at all. 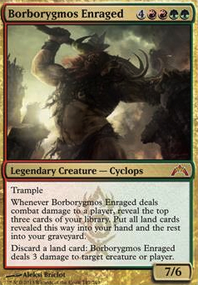 Seems totally alright, though I do not understand the choice of commander when looking at the list. 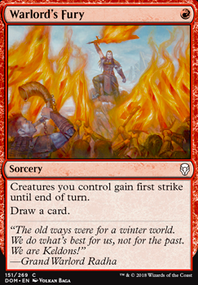 I see close to no sacrifices in the deck (Yahenni, merciless resolve and Kalitas). Also many of the cards are straight up bad... And with better counterparts at a low pricepoint. Instead of Merciless Resolve you could run Costly Plunder. Bone Splinters seems good, you have very few artifacts or artifact creatures considering how many delirium cards you run. I don't get why you don't run Evolving Wilds, Terramorphic Expanse, Desert of the Indomitable etc for the same purpose: turn on delirium. How do you plan on finding value with Stoic Builder? Seriously though: Hand of Death? Worm Harvest, Savage Conception and Syphon Life along with Dakmor Salvage can be pretty fun if you like slow value shenanigans, Barren Moor, Desert of the Indomitable and the rest of cycling lands are decent sources of card advantage with the Frog, Drownyard Temple, Gods' Eye, Gate to the Reikai and Dunes of the Dead might be worth adding as sacrifice fodder with some added utility. Hey, consider a different approach while still keeping the Dino Naya theme? Hour of Promise with Deserts, Gift of Paradise and New Horizons ramping into Zacama, Primal Calamity and Carnage Tyrant? I think you need to go completely over the top with the huge Dinos skipping the majority of the Dinos of three to five drop spots of the mana curve. Go completely over the top of Glorybringer and The Scarab God. Tribal Dinos competitively unfortunately can't compete with the other Midrange decks in Standard. There's just no reason to play Dinos over Gruul Monsters with Jadelight Ranger, Rekindling Phoenix and Glorybringer or Dimir Midrange with Glint-Sleeve Siphoner and The Scarab God or Golgari Snake or Grixis Midrange with most of all these powerful cards. Zacama with Gift and Horizons is a sweet interaction either helps to ramp into the Dino by also making different colors of mana. Zacama untaps all your lands when it ETB. Untapping lands with Gift and Horizons lets you then use Zacama's great abilities to kill your opponent's creatures. Go down some basics for Stirring Wildwood, New Benalia, Secluded Steppe, and Tranquil Thicket? Temple of the False God is also a possibility along with Desert of the Indomitable and Desert of the True. If there is any way to discard cards reliably, Riftstone Portal seems like a good choice. 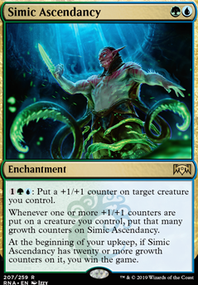 Growing Rites of Itlimoc Flip, Veteran Cathar, Duskwatch Recruiter Flip, Karametra, God of Harvests, Oketra's Monument, Rhonas's Monument, Collective Blessing, Beastmaster Ascension, and Zendikar Resurgent all seem like good options. Krosan Grip, Return to Dust, and Swords to Plowshares are things I would definitely throw in if you can afford the extra few bucks. 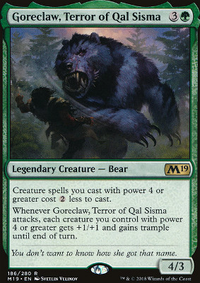 I don't think Unclaimed Territory is necessary for color fixing, especially considering the diversity of creature types; I would go up to 4x Sheltered Thicket if you can. I also recommend replacing a couple basic lands with 2 copies of Hashep Oasis. In my build, Dino Gruel, I've also added one each of the cycling basic deserts, Desert of the Indomitable and Desert of the Fervent. 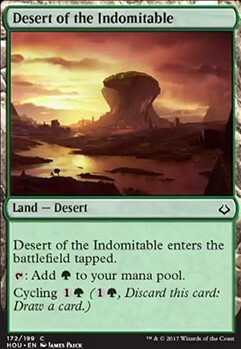 This gives you the flexibility to cycle when you no longer need the extra land, or you can sacrifice it to Hashep. The downside is only that it enters tapped, but it still makes for a decent turn 1 land drop in this deck. Have you seen the winning deck from the Memphis Grand Prix last weekend? The winner was playing a deck similar to what you've built. I like to look at the pro tour lists to get helpful suggestions for manabase and sideboard considerations. It looks like he had a similar idea on the lands to what I recommended in the previous paragraph.